Cervical discectomy is surgery to remove one or more discs from the neck. The disc is the pad that separates the neck vertebrae; ectomy means to take out. 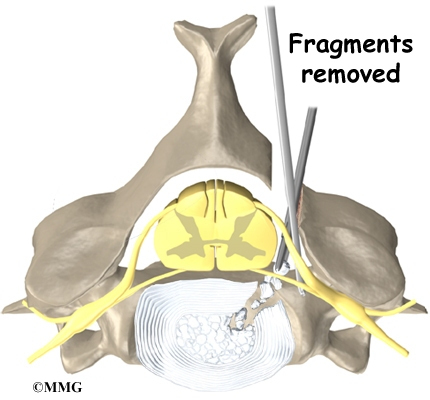 Usually a discectomy is combined with a fusion of the two vertebrae that are separated by the disc. In some cases, this procedure is done without a fusion. A cervical discectomy without a fusion may be suggested for younger patients between 20 and 45 years old who have symptoms due to a herniated disc. Surgeons usually perform this procedure through the front of the neck. This is called the anterior neck region. Key structures include ligaments, bones, intervertebral discs, spinal cord, spinal nerves and the neural foramina. Surgery is occasionally done through the back, or posterior region, of the neck. Important structures in this area include the ligaments and bones, especially the lamina bones. 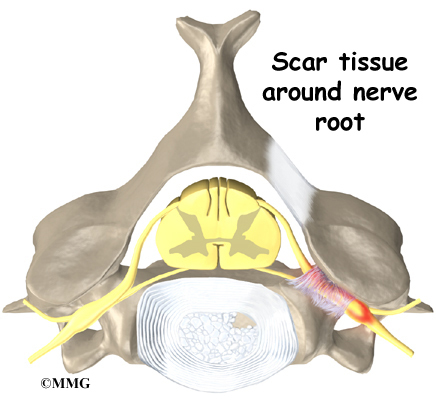 Discectomy is used to alleviate symptoms of a herniated disc. A disc herniation happens when the nucleus inside the center of the disc pushes through the annulus, the ligaments surrounding the nucleus. 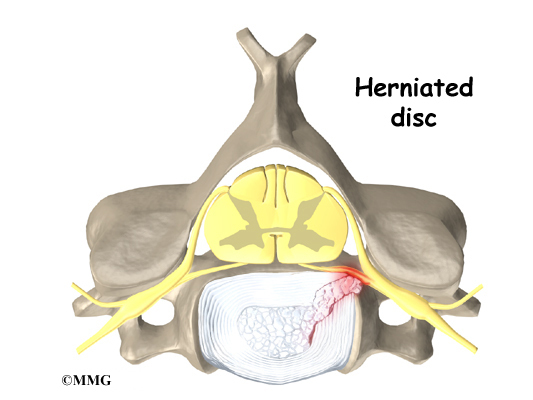 The herniated disc material may push outward, causing pain. Numbness or weakness in the arm occurs when the nucleus pushes on the spinal nerve root. Of greater concern is a condition in which the nucleus herniates straight backward into the spinal cord, called a central herniation. Discectomy relieves pressure on the ligaments, nerves, or spinal cord. Discectomy is also commonly used when the surgeon plans to fuse the bones of two neck vertebrae into one solid bone. Most surgeons will take the disc out and replace the empty space with a block of bone graft, a procedure called cervical fusion. Discectomy alone is usually only used for younger patients (20 to 45 years old) whose symptoms are from herniation of the disc. But some surgeons think discectomy should always be combined with fusion of the bones above and below. They are concerned that the empty space where the disc was removed may eventually collapse and fill in with bone. Inserting a bone block during fusion surgery helps keep pressure off the spinal nerves because the graft widens the neural foramina. The neural foramina are openings on each side of the vertebrae where nerves exit the spinal canal. Most research on discectomy by itself shows good short-term benefits compared to discectomy with fusion. But more information is needed about whether the long-term results are equally as good. Cervical discectomy is commonly done through the anterior (front) of the neck. 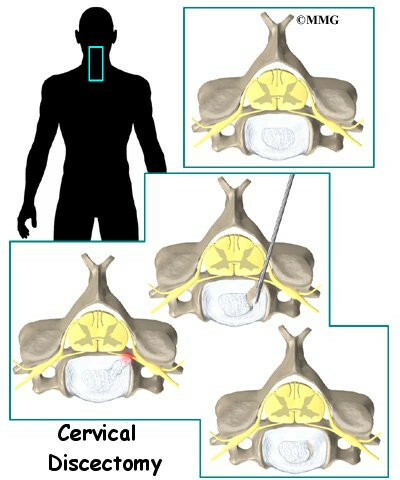 This is called anterior cervical discectomy. However, when many pieces of the herniated disc have squeezed into the posterior (back) of the spine, surgeons may need to operate through the back of the neck using a procedure called posterior cervical discectomy. The patient's neck is positioned facing the ceiling with the head bent back and turned slightly to the right. 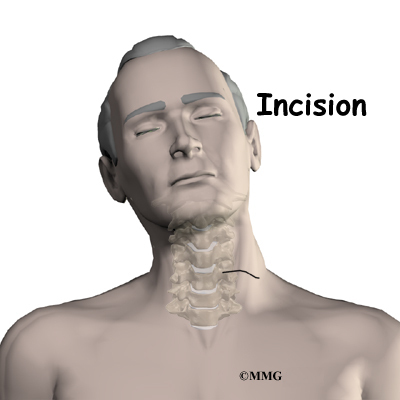 A two-inch incision is made two to three fingers' width above the collar bone across the left-hand side of the neck. The left side is chosen to avoid injuring the nerve going to the voice box. Retractors are used to gently separate and hold the neck muscles and soft tissues apart so the surgeon can work on the front of the spine. A needle is inserted into the herniated disc, and an X-ray is taken to identify and confirm it is the correct disc. A long strip of muscle and the anterior longitudinal ligament that cover the front of the vertebral bodies are carefully pulled to the side. Forceps are used to take out the front half of the disc. Next a small rotary cutting tool (a burr) is used to carefully remove the back half of the disc. A surgical microscope is used to help the surgeon see and remove pieces of disc material and any bone spurs that are near the spinal cord. This method is used when the herniated disc has fragmented into small pieces near the spinal nerve. The operation is usually done with the patient lying face down with the neck bent forward and held in a headrest. The surgeon makes a short incision down the center of the back of the neck. The skin and soft tissues are separated to expose the bones along the back of the spine. Then the surgeon may use an X-ray to identify the injured disc. A burr is used to shave the edge off the lamina bones, the back part of the ring over the spinal cord. When the disc has jutted straight backward into the spinal cord (central herniation), surgeons may need to completely remove both lamina bones in order to see better and to be able to clear all the pieces of the disc near the spinal cord. 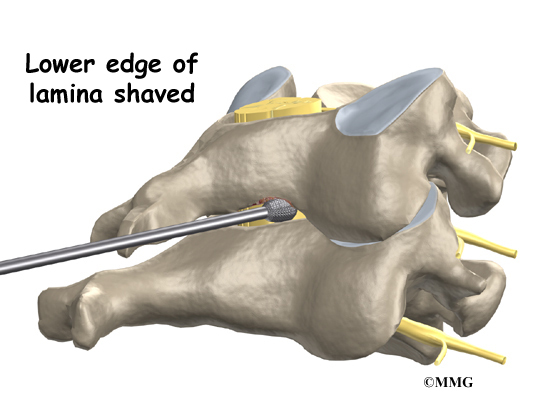 After shaving the lamina bone, the surgeon cuts a small opening in the ligamentum flavum, a ligament within the spinal canal and in front of the lamina bone. By removing part of this ligament, the surgeon exposes the spot where the disc fragments are pressed against the spinal nerve. Next, the spinal nerve is gently moved upward. Using a surgical microscope, the surgeon magnifies the area in order to carefully remove the disc fragments and any bone spurs. The nerve to the voice box is sometimes injured during surgery on the front of the neck. When doing anterior neck surgery, surgeons prefer to go through the left side of the neck where the path of the nerve to the voice box is more predictable than on the right side. During surgery, the nerve may get stretched too far when retractors are used to hold the muscles and soft tissues apart. When this happens, patients may be hoarse for a few days or weeks after surgery. In rare cases where the nerve is actually cut, patients may end up with ongoing minor problems of hoarseness, voice fatigue, or difficulty making high tones. Many patients get nearly complete relief of symptoms from the discectomy procedure. As with any surgery, however, you should expect some pain afterward. If the pain continues or becomes unbearable, talk to your surgeon about treatments that can help control your pain. Patients are usually able to get out of bed within an hour or two after surgery. Your surgeon may have you wear a hard or soft neck collar. If not, you will be instructed to move your neck only carefully and comfortably. Most patients leave the hospital the day after surgery and are safe to drive within a week or two. People generally get back to light work by four weeks and can do heavier work and sports within two to three months. Outpatient physical therapy is usually prescribed only for patients who have extra pain or show significant muscle weakness and deconditioning. Patients usually don't require formal rehabilitation after routine cervical discectomy surgery. Surgeons may prescribe a short period of physical therapy when patients have lost muscle tone in the shoulder or arm, when they have problems controlling pain, or when they need guidance about returning to heavier types of work. If you require outpatient physical therapy, you will probably only need to attend therapy sessions for two to four weeks. You should expect full recovery to take up to three months. At first, therapy treatments are used to help control pain and inflammation. Ice and electrical stimulation treatments are commonly used to help with these goals. Your therapist may also use massage and other hands-on treatments to ease muscle spasm and pain. Active treatments are added slowly. These include exercises for improving heart and lung function. Walking, stationary cycling, and arm cycling are ideal cardiovascular exercises. Therapists also teach specific exercises to help tone and control the muscles that stabilize the neck and upper back. Your therapist works with you on how to move and do activities. This form of treatment, called body mechanics, is used to help you develop new movement habits. This training helps you keep your neck in safe positions as you go about your work and daily activities. You'll learn how to keep your neck safe while you lift and carry items and as you begin to do other heavier activities. As your condition improves, your therapist will begin tailoring your program to help prepare you to go back to work. Some patients are not able to go back to a previous job that requires heavy and strenuous tasks. Your therapist may suggest changes in job tasks that enable you to go back to your previous job. Your therapist can also provide ideas for alternate forms of work. You'll learn to do your tasks in ways that keep your neck safe and free of extra strain.